Turmeric which is regarded as one of the most powerful ingredients of great medicinal value can be used as a multipurpose component in our daily life. In countries like India, people use turmeric as an agent to add beauty to their skin and also it gives proven benefits. In modern world, the turmeric is added as an ingredient in many cosmetic products and other items which has made the people to utilize the resources that are provided by the turmeric. Also the turmeric is used an ingredient for preparing many dishes in the countries of India and china to make curry products. In this article, we will have a look at the beauty benefits of turmeric, which are totally based on the researches and evidences from the experts. Turmeric can be used as an ingredient to increase the elasticity of skin. The reason being, turmeric contains many antioxidants in nature and hence can protect the layers of skin, making it to glow and maintain the freshness of the skin at all times. It helps in inducing the cell growth in the skin and does not allow any pores between the cells in the skin and remains closely packed with each other. Many of us might not know the fact that the pigments which are available in our skin are mainly responsible for maintaining the complexion of the body. Some who are brown in complexion, have the possibility of composing dark level of pigments in their skin tone. In such cases, the turmeric helps to lighten the pigmentation color of the skin and helps in improving the complexion of the person. 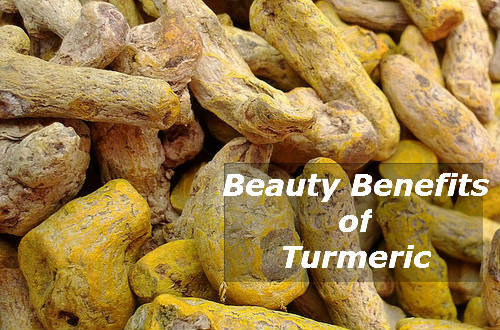 Thus turmeric has the capability to improve the color tone of a person when used regularly. The nature of the skin varies from one person to another depending on various factors including heredity. In such cases, there may be people with dry skin and some people may have an oily skin. For people with dry skin, many conditioners and cosmetic products are available to make the skin back to normal condition. For people who suffer with oily skin, they will have various disadvantages with their skin protection. The main reason for acquiring oily skin is due to heavy consumption of oil filled food items in some cases. In such cases, the turmeric can be of great use. Applying turmeric regularly on the skin either directly or mixed with water with some mixture of sandalwood, will remove the dust particles and the oil contents in your skin and make it glow better. Some people may have got injured sometime in their life and may have the marks of the wound left behind. In some cases there may be some stretch marks on any part of your body. The removal of these marks can be completely demolished with the help of turmeric. The turmeric has the capabilities to lighten these stretch marks. The turmeric can be mixed with yogurt or rose water and can be applied over the infected area. This treatment when done regularly can be used to lighten the stretch marks and bring the normal tone to the skin. Many people in today’s modern world has shifted widely to cosmetic products for eradicating the pimples and the acne present in them. They might have forgot that turmeric is the main ingredient in all those cosmetic products they use. Hence without using the cosmetic products , the removal of pimples and acne can be done in a natural way with the help of turmeric. Taking turmeric powder in small quantities and mixing it with some sandalwood powder with rosewater will surely produce some best results. Regular usage of turmeric on the skin will also prevent the formation of pimples and acne in the skin. Turmeric when mixed with some coconut oil and applied to the heels will not only remove the cracks from the heels but also maintains the beauty and shape of the legs.